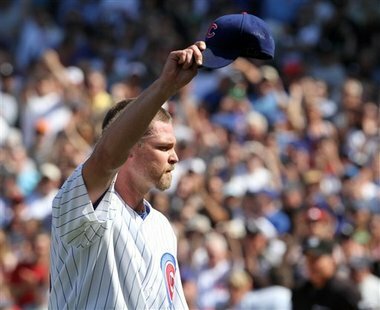 At the age of 34, Kerry Wood has decided to hang up his cleats and end a 13 year career after landing on the disabled list over a dozen times.”My body wasn’t bouncing back this year. I felt like I was putting guys in the ‘pen in situations they didn’t need to be in. I definitely didn’t want to go out with my last inning being me throwing my glove in the seats,” Wood said. He ended up allowing just one hit while walking none. I have never seen a ball move as quickly, before or since with the exception of Nolan Ryan. His arsenal basically consisted of a slider, curve, and his famous heater which rendered batters frozen in their shoes as the ball would whiz past them. When you see the video, you’ll witness movement on his fastball that made it almost impossible to hit. He began as a starter but then unfortunately, the DL would be his home for 14 of the 13 seasons in which he played. In 1999, just his second season in the majors, Wood missed the entire year after undergoing Tommy John surgery. In 2007 he transitioned to a relief pitcher due to all the injuries.”I had a blast. I wouldn’t trade it in, I learned from the injuries, I learned about my body and what it takes to compete and go out and play every day,” Wood said Friday after his final game, fittingly against the Chicago White Sox. I got to see him pitch when he came to the Yankees in July of 2010 in a trade for prospects Andrew Chive, Matt Cusick, and cash. He would end up becoming Mariano Rivera’s set up man. Wood pitched pretty well for the Yanks, finishing 2-0 with a 0.69 ERA in 24 games, including 21 straight scoreless appearances. I remember being disappointed when the Yankees decided not to pick up Wood’s option that fall for the 2011 season. Instead, he ended up returning to the team that he’ll always have a fondness for the Chicago Cubs; the team that drafted Wood as the fourth overall selection in the 1995 Amateur Draft.